ACCRINGTON, our goal is to manufacture top quality, good price, fast delivery and full-time services in press brake tooling. This goal will let all customers success in the sheet metal fabrication fields. We kindly invite you together to share the growth with us. We inported company known as ACCRINGTON EQUIPMENT & TRADING imported INDUSTRIAL KNIVES for all range / brand of hydraulic guillotine shearing machine. POLYURETHANE DIE & NO MAR BRAKE DIE FILM for sharp, radius and no mar bending on prepainted material, aluminium and stainless steel. All above are Ex-stock ready. 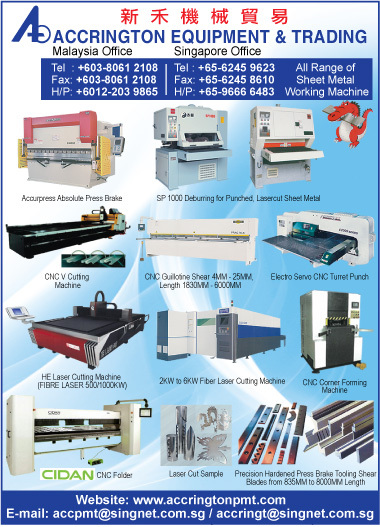 Also all range of sheet metal working machinery.